Last week Houston City Council voted to hire a company that will help local officials create and adopt a long-range waste and recycling plan. This wasn’t all over the news, but it is indeed a big deal—and a significant victory for TCE that was years in the making. It could put Houston on a path to become the largest city in Texas working toward a Zero Waste future! Let’s rewind seven years to 2011. 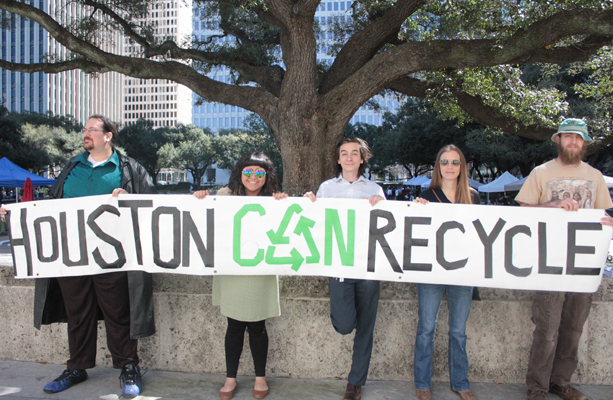 Houston officials were considering a new 20-year recycling contract with Waste Management Inc. While City Council prepared to hold its vote, we joined forces with local union organizers to build public pressure against the contract for two reasons: City officials had not asked any other recycling companies for competitive bids, and they also did not have a long-range plan for waste and recycling in general. We advocated fiercely for an open bidding process so the city would get the best deal possible and for a long-term recycling plan that would set the standards for any future recycling proposals. We got the word out, pounded the pavement, and turned the up the heat on elected officials. Together with our labor allies, we convinced City Council not to sign the 20-year, no-bid contract, which was certainly a victory. 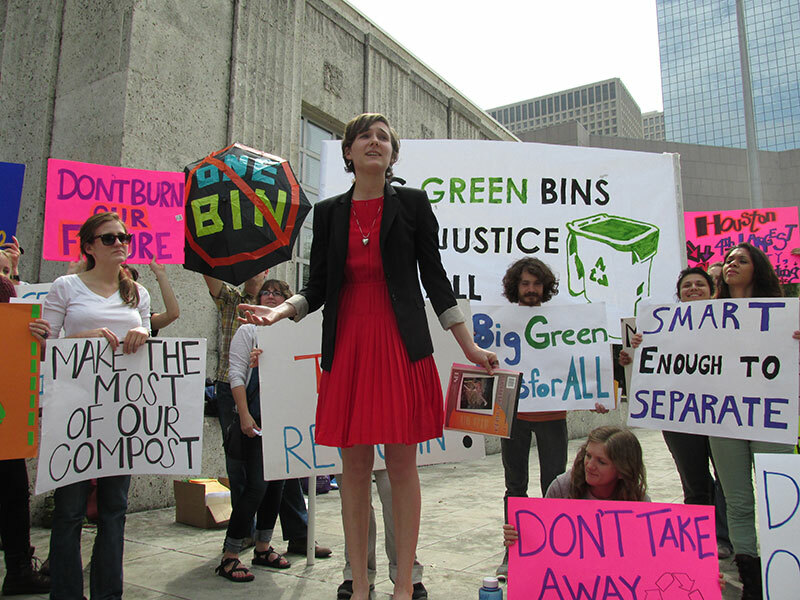 City officials punted on the controversy by signing a short-term recycling contract instead. We pointed out that two years earlier, Austin had adopted its own long-range plan to reduce waste by 90% by 2040—known as a Zero Waste Plan—and we argued that Houston should begin the process to accomplish the same thing. However, City officials responded by claiming that “Houston doesn’t do long-range planning.” We did our best to keep the pressure on because we knew that a Zero Waste Plan would be a huge win for residents and the environment. What came next was a crazy curve-ball that bitterly divided the city and slowed our progress for the next five years: In 2012 Houston officials began considering a truly hair-brained scheme to eliminate curbside recycling and have residents toss all their waste and recycling into a single bin, which would be sorted out afterwards at a new $100 million “One Bin for All” facility. Some of the discards would end up being incinerated—adding to Houston’s infamous air pollution woes—and the new waste facility would be located in a low-income community of color. This was seriously bad news. At first we hoped to convince city officials to quickly eliminate this proposal, given the overwhelming evidence that similar schemes had been tried and had utterly failed all over the world. We produced a detailed report laying out all the real-world examples and cautionary tales still in the making. Unfortunately, Mayor Annise Parker and her administration dug in and pushed as hard as they could to move this proposal forward. We pushed back with unrelenting grassroots pressure and assembled a diverse, powerful coalition that included the local NAACP chapter and Dr. Robert Bullard, known as “the father of environmental justice” for his work to shut down incinerators in Houston’s minority communities decades ago. We held demonstrations and rallies, packed City Council meetings, and generated tens of thousands of public comments against the plan. This pitched battle became national news and wound up in the New York Times. Our pressure paid off by stalling the bad proposal long enough to run out the clock on Mayor Parker’s final term in office. We even made some progress in the meantime: Houston officials agreed to (finally!) provide curbside recycling for all single-family homes served by the city. And when Mayor Turner took office, he flatly rejected One Bin for All. Of course, we had been educating him on this topic for several years already by then! With another giant victory under our belt, we again encouraged city officials to get the ball rolling on a long-term Zero Waste Plan. Dallas and San Antonio had each created long-range recycling plans by now, putting Houston behind the curve. Instead, in 2016 Houston officials actually considered abandoning curbside recycling in the name of budget cuts! We were thrust into another raging fight over the city’s proposed recycling contract, this time with the possibility that there wouldn’t even be one. Things got ugly between Waste Management and Mayor Turner, escalating the drama. We were proud to help save curbside recycling when the City Council rejected the idea of eliminating it and instead voted for a short-term contract to keep things in place while a long-term solution could be identified. We did suffer a casualty, as glass was no longer accepted at the curb. But importantly, City officials finally recognized the need for a long-range waste and recycling plan. This laid the groundwork for last week’s victory as well. The next thing Houston officials worked on was a new long-term recycling contract, and this time they opened the process for all interested companies to submit competitive bids. We asked City Council to make sure that the new contract would be able to meet Houston’s increasing recycling needs, resulting in a final deal that was $11 million less costly than originally proposed. At the start of 2018 City Council approved a 20-year contract with a firm that has many facilities overseas but is relatively new in the U.S.—they had won a long-term contract in Dallas as well. They are building a new recycling facility in Houston and glass will return to curbside recycling. This was yet another big win for recycling advocates! Whew—we’ve finally caught back up to the present with last week’s vote for a long-range waste and recycling plan. We’ve been pushing for this since 2011, and the implications go way beyond curbside recycling. 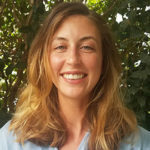 Other cities in Texas have adopted plans that include game-changers like recycling at all multi-family buildings and businesses, food waste recovery and curbside composting, and construction/demolition material recycling. We can and should take these strides forward in Houston as well. Our task now is to ensure that the long-range plan will put our city on the path to Zero Waste. As this process unfolds over the next year, city officials will hold public meetings and accept feedback from residents. That means Houstonians will be able to help us tell elected officials to make this an aggressive Zero Waste Plan, not a weak, business-as-usual approach. 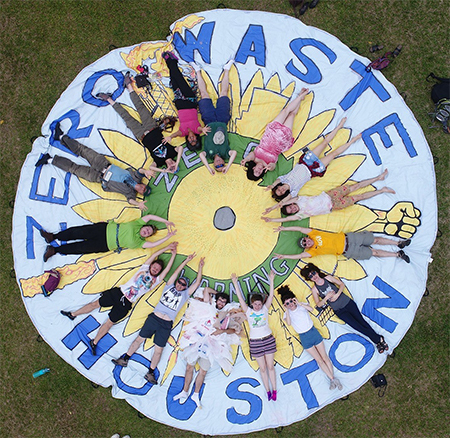 Houston can join the ranks of Zero Waste cities across the country and world, but only if we make our voice heard now! Let’s gear up for another win for the environment and sustainability.